The Steam summer sale is underway, and all of our wallets are at risk. Oh hey look, it's The Legend of Grimrock for six bucks! Oh wow, Civilization V for cheaper than ever! Don't mind if I do! Never mind the fact that I still have a few games from the last big Steam sale basically unplayed. These deals are too good to pass up. I can't stop the bahhhgains! 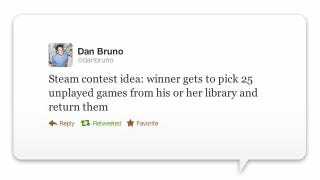 Harmonix employee and regular source of twitter humor Dan Bruno has floated a new and possibly revolutionary idea: a contest where the winner gets to finally freakin return the scads of unplayed games he or she has bought in past Steam sales. Ha!